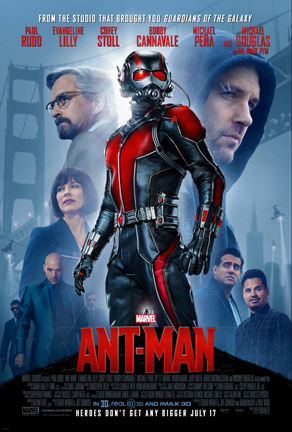 Movie goers -- and quite possibly those who typically don't enjoy super hero films -- are in for a real treat with the release this Friday of Ant-Man, the newest action-packed Marvel Cinematic Universe major motion picture. When I first heard Marvel was coming out with Ant-Man, I was not sure that it would be successful. I had not seen much press or promotion for it except for the backs of some bus stop benches and maybe one or two billboards. However, a few minutes into the movie, all my worries vanished into thin air. First off, this movie is not only loaded with fast-paced action, it is downright hilarious with some of the funniest moments when you'd least expect them. Like Ant-Man's predecessor, Guardians of the Galaxy (2104), Marvel uses the same super hero comedy movie technique to great effect. In fact, after seeing Ant-Man, I think it is even more laugh worthy than Guardians of the Galaxy with every joke and pun Ant-Man makes certain to have everyone roaring in your seats. 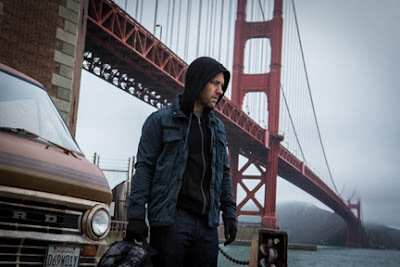 Directed by Peyton Reed (Yes Man, The Breakup), Ant-Man is the story of Scott Lang a divorced father of a little girl who he loves dearly but doesn't get to see due to custody issues resulting from his criminal past. Now he's a newly released prisoner and skilled mechanical engineering degree who morphs into a save the world hero, played brilliantly by Paul Rudd (I Love You Man, Role Models) when he teams up with mentor Dr. Hank Pym (portrayed by multi Oscar winning actor Michael Douglas) and Pym's daughter Hope (Evangeline Lilly). 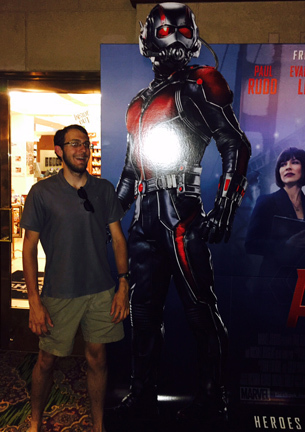 My mother, a huge fan of Michael Douglas who plays the formidable Dr. Hank Pym, came with me to the screening. Prior to either of us watching this movie, I wasn’t sure that she would enjoy this as much as I would, not having seen any of Marvel's other films. Not only did she think Douglas put on a fine performance in this film. Even though this picture incorporated several elements of other movies in the franchise, this one still had more than enough to keep a novice Marvel movie watcher like mom on the edge of her seat from start to finish. Speaking of ideas from other Marvel movies, quite a lot of this film made references to other Marvel super heroes in general. Of course, as with every other Marvel film there is a Stan Lee cameo, so stay on the lookout for that! Also, I can’t give too much away, but there is another cameo from a star of a Marvel movie you may have seen a while back, and if you enjoyed this film I'm referring to, then you likely will be elated when he shows up on the big screen in Ant-Man. 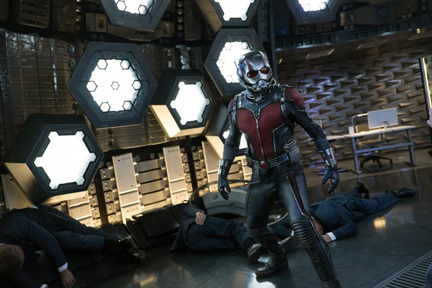 One last thing I want to touch upon is the action sequences in Ant-Man. 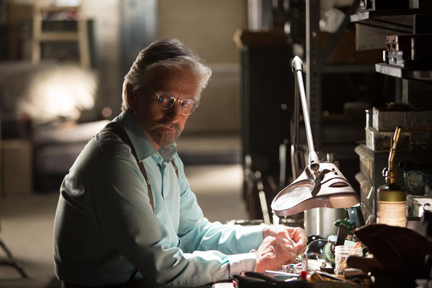 As some of you may already know, Ant-Man’s unique superpower is that he has the ability to shrink in size and grow in strength as he gets smaller. This leads to some pretty awesome fighting sequences wherein the camera angle shrinks down to an ant's perspective and then zooms back out to a human’s perspective. If you have seen the super hero television show The Flash then you can kind of visualize what I am talking about here. Ever heard the expression it's not over till it's over? Well, you'd be wise to stay till the very end of this movie. Marvel is known for having one (or even more) Easter Eggs at the end of their movies where they include a short clip at the end of each film somewhere among the end credits. So, as you see people leaving the theater, and the credits roll on the screen, stay in your seat! It will be worth the wait. FTC Disclosure: Except where indicated otherwise, The Walt Disney Company provided all images that appear in this post as well as invited MommyBlogExpert to a media screening of this movie at the El Capitan Theater prior to release to facilitate this review. No payment or other compensation was received in connection with this post and opinions here are my own. See complete FTC Disclosure information that appears at the bottom of MommyBlogExpert's home page and at the bottom of every individual post on this blog, including this one.